Road Trail Run: ON Cloudventure Review: Great Looking, Steady, Sturdy Trail Cruiser. For Mellow Trails Only! ON Cloudventure Review: Great Looking, Steady, Sturdy Trail Cruiser. For Mellow Trails Only! 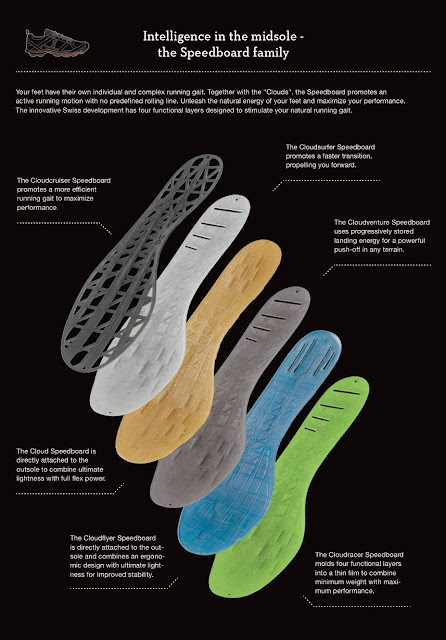 The Cloudventure is ON Running's first trail shoe. Swiss Engineered ON shoes feature CloudTec cushioning, a series of hollowed through outsole pods designed to deflect on initial impact then rebound when weight comes off. Beautifully built ON shoes really show that legendary Swiss quality. Jeff Valliere and I look at how ON's trademark CloudTec pods translate to ride and performance on a variety of trails from Utah smooth single track to the rocky technical trails above Boulder. Sam: At first glance with its dense Swiss Army gray uniform upper, prominent toothy CloudTec elements, and unseen long, rock protecting SpeedBoard the Cloudventure says more hiker than trail shoe to me. And while at 10.8 oz this is no hiker but it is not the lightest of modern trail runners either with a weight right with the Brooks Cascadia and Montrail Caldorado. On the run the Cloudventure for me is best suited to slower than faster paces and smooth cruiser trails. The grip is outstanding on softer grit, the forefoot cushion soft on landing and with great protection but stiff. And, this is a good thing as this one comfortable shoe for long, easy ambles. On smooth Utah rolling single tracks, for easier days it was a joy to run. Thinking it might be good on the road I tried it there and found it strangely firm, running like a shoe with far less cushion, likely to the lugs being far easier to compress than ON road shoes and lower in profile, particularly in front and the firm midsole. This said while I struggled with it on the road, the overall cushioning is far more balanced than the CloudFlyer and Surfer, were particularly in the heel. Jeff: I was immediately struck by the good looks and well built feel of the shoe. The materials used to make the upper are of the highest quality, sturdy, well constructed and it is clear that no corners were cut. When I first slipped my foot in the shoe, I found fit and comfort to be excellent, but perhaps ever so slightly on the roomy side. I figured I could compensate a little by tightening the laces up a bit more, but was unable to do so, much of which I attribute to the very thin and static laces. The Cloudventure feels a bit heavy in the hand and equally so on the foot, as Sam notes, comparable to a Cascadia or Caldorado. Sam: The upper is a single layer of densely woven, thick engineered mesh with an inner bootie attached to the tongue at the midsole and running to the front of toe. There is a substantial thick but not overly firm toe bumper. The rand overlay between midsole and upper is heavily reinforced with a layer of thick rubber running from the heel to the toe on lateral side but tapering towards the front of the shoe. On the medial side the reinforcing stops at the 3d lace hole, for some added flexibility at toe off. The reinforcements remind of an approach shoe. Both the tongue and heel collar have thin and firm padding. This is not a plush padded shoe. It's all business. Sam: The upper fit me well with good support all over without being constraining. The heel counter is very firm and extends all the way forward to the inverted U but isn't overly high, a good balance. The upper is durable and well reinforced in all the right places. The very long thin laces are problematic. While they work well at the front of the lacing a wider lace or a lace loop would better cinch the midfoot and prevent frequent re tying. Jeff: I found the upper to offer good support under most circumstances, but when I pushed this shoe on steeper, more technical terrain, rock hopping, etc... my foot would move around a bit inside the shoe, as with the ultra thin static laces, I was just not able to lock down the midfoot quite enough to compensate for the added volume. I was still able to maintain control, but the sliding inside the shoe was noticeable. In viewing the Cloudventure, ventilation appeared to be limited, but I found breathability to be better than expected, even when the temps are in the 90’s. The toe bumper and rand are thick, protective, sturdy and hold up well to abuse in rocky, technical terrain. The heel collar/cup is on the low side, is slightly boxy and does not conform perfectly to my heel. Despite that though, I found it to hold well, is comfortable and never caused any issues or blistering. The materials used for the upper, particularly around the forward edges of the collar are quite stiff and rigid. The materials soften a little over time, but I notice it each time I put on the shoe throughout the test period. Even with thin socks though, I never noticed excessive rubbing or had any blister issues. As alluded to earlier, the laces stand out as something that could stand to be improved. They are about as thin of laces as I have ever seen on an athletic shoe and are excessively long. They are somewhat difficult to snug up and then over the course of a run, loosen up and require re-tightening. Even with double and triple knotting, due to the static rigidity of the laces (and thinness), they can come completely untied. The secret sauce of ON Running are the CloudTec pods. The pods are channeled shaped outsole pieces which deflect down with weight and then pop back when un weighted. To keep from deflecting sidewards as weight is applied the teeth on the yellow outsole pods lock into ridges in the midsole. The pods on the Cloudventure are notably easier to deflect and are lower than the road CloudSurfer (review here). Sam: Does this translate into a soft shoe? Not really as the midsole is very firm and the incorporated Speedboard within the midsole stiff. 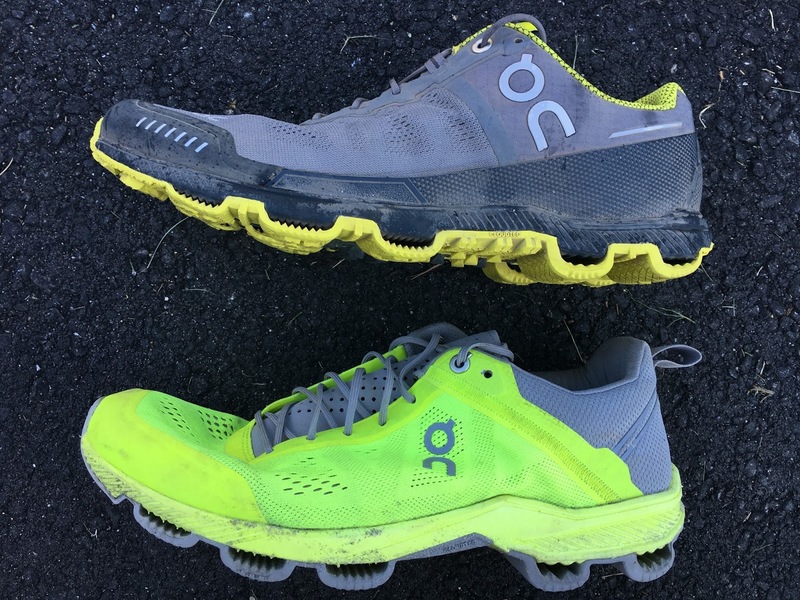 The front pods in particular seem to take any firm edge off of trail obstacles without compromising feel or stability and without making the shoe overlay firm up front. Toe off is pleasant and assured but not particularly dynamic for me. The heel firmness and stability is just about right for a rougher trails shoe for me. Wait didn't I say I preferred the Cloudventure for easier cruising trails and moderate paces. Yes I did as there is more inside the Cloudventure, what ON calls its Speedboard. The Speedboard is a full length plate embedded in the midsole to provide a springboard effect and direction to toe off from lateral to medial as well as some light pronation guidance. To make it work as intended I think the runner has to be dynamic and strong, like Jeff and not like me! I find it stiffens the shoe considerably not in an inflexible sense but in a long gradual firm flex. I prefer an easier flex upfront with strong mid and rear foot support, this last which Cloudventure has in spades. Jeff: I found cushioning to be on the firm side, but offered quite a bit of protection and comfort over long periods, no matter the terrain under foot. I found the Speedboard beneficial in that it offers great rock protection while maintaining a reasonable amount of torsional flex, most notably when leaping/balancing from rock to rock. I found response to be a bit sluggish at toe off, no matter the surface or gradient, which, combined with the weight of the shoe, does not inspire quick or spirited running. The outsole has what ON calls "Micro-Engineered Grip Rubber". There are 4 zones of differing grip patterns along with an overall fine pattern of diamonds. Sam: I have found traction outstanding on fine lose grit over hard surfaces, middle of summer dry Utah conditions. I pay close attention to the nuances of grip on uphills and the Cloudventure just sticks, not even the slightest slipping when pushed or steep. My 30 or so miles were mostly smooth single track taken slowly with minimal technical difficulty and relatively few rocks with 6 or 7 miles of road thrown in. Zero wear for me but none of my terrain was technical. Jeff: The Cloud pods are the most unique/outstanding aspect of this shoe and I’ll admit to being a bit skeptical of them at first. On climbs, I felt that the pods compress a bit upon toe off and the compression gave an ever so slight feel of inefficiency. This was most noticeable on harder surfaces, particularly rock and more particularly uneven, pointed rocks. I also noticed that when landing a pod on the crest of an angled/pointed rock, I noticed a bit of an awkward “pivoting” sensation. Whether any of this truly leads to inefficiency is debatable, but for me, the perception was there. However, what the pods lack in ascending advantages, they more than make up for on flatter ground and particularly on descents. I found that they offered a good bit of extra cushion on the downhill, compressing and conforming to the terrain in such a way that they would absorb much of the impact before the midsole cushioning had to. I also found traction in technical terrain to be excellent, in part because of the way that the pods conform to and grab the terrain underneath. My biggest concern however, is the durability of these pods. 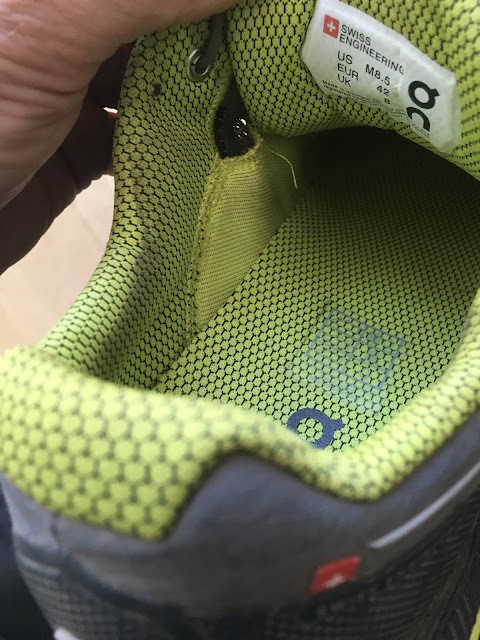 After a mere 30 miles of running on a combination of paved road, gravel paths/dirt road and ~20+ miles of rocky, technical singletrack (with a bit of off trail), I have already lost 1 pod in the forefoot and one of the heel pods is also well on it’s way to destruction. Granted, the trails here around Boulder that I run are rocky and technical and are sure to reveal any weaknesses in the durability of a shoe, but I test all shoes on the same terrain. This level of wear after such a short period is quite concerning. Sam: Much as with the CloudSurfer I have a hard time getting past the Speedboard and to some extent the pods and the firmness of the midsole at landing to arrive at a dynamic fast ride and WOW factor. For some reason I feel somewhat disconnected from road or trail in ON shoes. Others with strong leg drive and push off likely will find them more dynamic.The Cloudventure is for me a very fine moderate pace shoe, highly protective and easy to run and a delight on smoother graded single track, taken easy, and based on Jeff's experience smooth trails with few technical rock sections. This where they should stay until ON figures out how to make the lugs more durable. As far as great looks and utility as an easy hiker, travel with some running and everyday shoe, outstanding. Jeff: I found the ride of the Cloudventure to be best suited for easier to moderately paced runs on less technical trails. I was unable to get any pop or snappy response out of the Speedboard and overall the Cloudventure did not feel at all performance oriented, if not sluggish and somewhat inefficient on the uphills. I would recommend this shoe for those looking for, well, I’m not sure. Due to the surprisingly rapid rate of wear of the pods, I have trouble recommending this shoe despite liking many other aspects (traction, protection, quality of the upper, cushion, comfort, looks/style). I think this shoe would be a reasonable alternative for the Cascadia fans who feel it has become too narrow and want a roomier toe box and overall fit, but who run moderate to well graded, softer terrain. Additionally, the Cloudventure, with its classy good looks, would make a great all around daily shoe, as it dresses up well and would look great out to dinner, social events, or traveling where you need to pick a shoe that looks nice, yet can handle hiking and running. -0.3 for sluggish and stiff feel on anything other than moderate paces on easy terrain. Nice review. Maybe you can suggest more training shoes for men? Thank you! I'm doing my first Spartan race, but will be doing more trail running than obstacle races in the future with these shoes. Currently I'm looking at the ON Cloudventure; Salomon XA Elevate, Reebok All-Terrain 3.0 or one of the Inov-8 shoes. What would you recommend? I have a pair of the Cloudflow running shoes and I love them, but I'm concerned with the durability of their trail running shoe, especially on obstacles. Thoughts? Thanks for reading and commenting! I might agree that durability of ON lugs may be an issue on rough terrain. The XA Elevate is a great all around shoe, one of the best of 2018. You might also look at the upcoming Hoka Torrent, review just posted today, the Altra King MT 1.5, more obstacle big grip focused, the NB Summit Unknown and the older Peregrine 7, likely on sale somewhere. Reviews of all below at our index page below. Sam, you sold me on the Hoka Torrent. However my race is in May so I won't have time to get this shoe since it isn't available until June. Would you lean towards the Salomon XA Elevate or the NB Summit Unknown? I will use this for the Spartan race, but also for future bootcamps, training, trail running, and hiking.